Every four years, journalists propel a presidential campaign into the national consciousness. New candidates and issues become features of the political landscape while familiar rituals are reshaped by the unpredictability of personalities and events. Underlying this apparent process of change, however, is a recurrent cycle of political themes and social attitudes, a pulse of politics that locks the process of choosing a president into a predictable pattern. In this bold and brilliant examination of modern presidential politics, James David Barber reveals the dynamics of this cycle and shows how the pattern of drift and reaction may be broken in this most critical of political choices. Barber probes beneath the surface of campaigns to detect a steady rhythm of major political motifs. The theory he advances in colorful narrative chapters is that three dominant themes-conflict, conscience, conciliation-recur in foreseeable twelve-year cycles. A combative campaign-Truman vs. Dewey in 1948-is followed four years later by a moral crusade-Eisenhower vs. Stevenson in 1952-which in turn is succeeded by a contest to unify the nation-the Eisenhower-Stevenson rematch in 1956. The pattern is then renewed: the fierce combat between Kennedy and Nixon in 1960 was followed in 1964 by the contest of principle between Johnson and Goldwater. In 1968 Richard Nixon defeated Hubert Humphrey by promising to bring the nation together. Monitoring shifting national political moods is a new elite: the journalists. Barber makes the case that the party system, increasingly clumsy and inflexible, can no longer pick up the beat of politics. Instead it is through newspapers, magazines, and television that the main themes of a campaign are sounded, created, and destroyed. 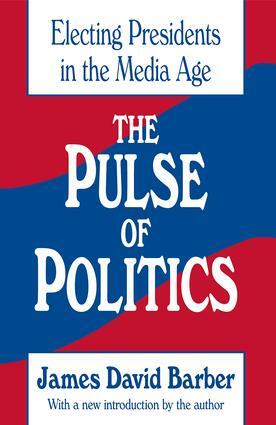 This new edition of The Pulse of Politics provides a timely guide to the themes of the 1992 presidential campaign and to future elections. It will be of special interest to political scientists, historians, media analysts, and journalists.